Growing up in Chicago, the name Fergie Frederiksen is one that is not only familiar, but one that is held in very high regard. Many will tell you that Frederiksen is the greatest voice in melodic rock, and they wouldn’t get too much of an argument from me. In 1975, Frederiksen was asked by Tommy Shaw to replace him in MSFunk as Shaw was leaving the band to join Styx. Frederiksen would later start Trillion and sing backing vocals on many of Survivor’s hits. But, it was his stint with Toto that probably got him the most attention. 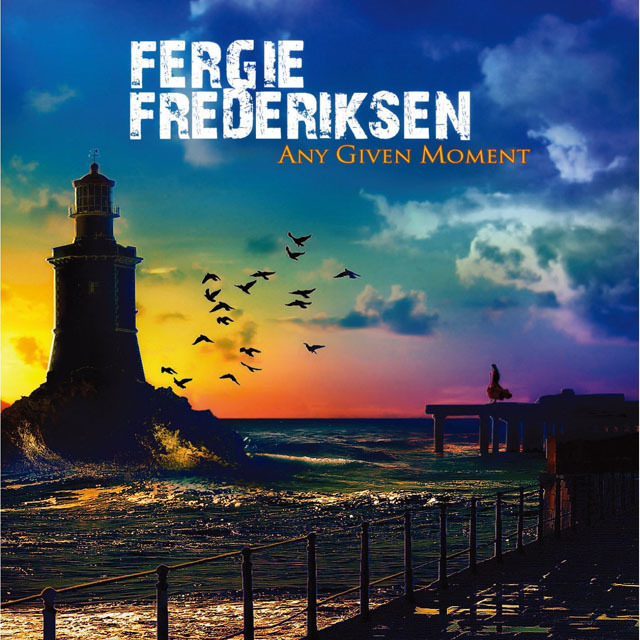 It makes no difference how you might be familiar with the talent of Fergie Frederiksen, but once you are it’s hard to think about melodic rock in the same way. In June 2010, Frederiksen announced he had inoperable cancer and that recording sessions were difficult for him. Since that point, thanks to a friend who pushed him to continue doing what he loves, he has recorded Happiness Is The Road in 2011, and this current album, Any Given Moment. And I must admit, I had serious reservations about how this might sound. Would I be getting a man struggling to be what he once was? Would his voice be more demure and uncomfortable because he lacks confidence in his abilities? As much as I love the man and his voice, I did have some doubts. Doubts that would slap me right in the face just a few seconds into this disc. This is an album that has some of the best melodic rock songs of the past twenty years on it. These songs have all of the best elements of the genre; the soaring vocals, catchy choruses, compassionate guitar solos, keyboard runs and simply awesome harmony vocals. Think about your favorite Survivor or Journey songs all on the same disc - that about sums up what you get with Any Given Moment. These are songs that stand tall and confident, with an inspirational keel to them. And, perhaps the most surprising fact about the songs, is that they rock. I thought we might get an album of somber ballads, or songs that might play out like a last will and testament. instead, these songs climb to the peak of Mt. Inspiration, stretch their arms out wide and rock hard. The strength, range, and clarity of Frederiksen’s voice is miraculous. Even barring his medical condition, this is a man in his early 60’s. The fact that his voice still soars so high and clear is something that is chilling. The fact that he can do this while he is being medicated and battling for his life doesn’t even seem humanly possible. Alessandro Del Vecchio produced Any Given Moment, and also helped to pen some of these melodic masterpieces. The employment of great players like Bruce Gaitsch (Richard Marx) and Robert Sall (W.E.T.) proves to be wise as well. The guitar work on the record is as good as anything I’ve ever heard. There are many memorable solos tucked into so many memorable songs, it really is something special. If you are a fan of Survivor, Styx, Toto, Journey, Triumph, and all of the other classic melodic rock bands, you NEED this record. I can’t imagine someone that enjoys classic melodic rock not falling in love with this record. Not only is this one of the best records of 2013, it just might be one of the best of this millennium.